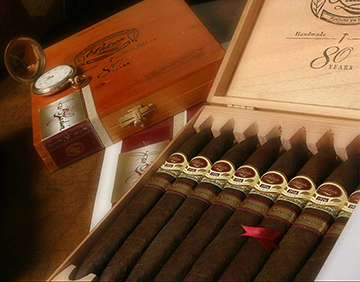 The Padrón 1926 Serie line of cigars premiered in 2002 to commemorate José O. Padróns 75th birthday. The 1926 Series consists of seven sizes available in sun-grown natural and maduro wrapper. All tobacco used in this line is aged for five full years. The refined tobacco is then blended to create an exceptionally smooth, complex, balanced and full-bodied flavor. Continuing Padron's tradition, the 1926 Serie is offered in a box-pressed format with the exception of the No. 90 tubos. For the protection of Padron's customers and to safeguard against counterfeiting, a specially designed double band featuring an individually numbered guarantee label is applied to each and every cigar. Annual production of this offering is limited to 100,000 cigars.